Abu Dhabi: A unit from the UAE's Anti-Terrorist Special Forces, supported by Air Force and Air Defence units, has successfully freed a UAE-flagged vessel, MV Arrilah, from pirates in the Arabian Sea, east of Oman, an official source from the Armed Forces said. 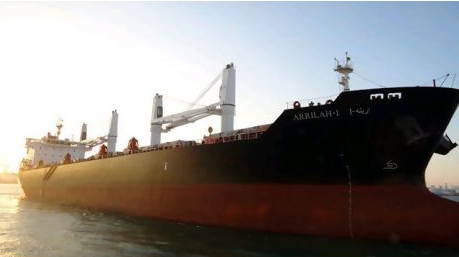 The bulk carrier MV Arrilah-I came under attack in the early hours of April 1 in the Arabian Sea. M.V. Arrilah-I, a 37,000 metric ton deadweight, handy size bulk carrier, was sailing from Australia to Dubai's Jebel Ali Port. The vessel, belonging to the Abu Dhabi National Tanker Company, Adnatco and NGSCO, had been attacked and seized by pirates on the morning of April 1. "The Anti-Terrorist unit, supported by the UAE Air Forces and Air Defence units, and in coordination with the US 5th fleet, boarded the vessel today, following which the pirates surrendered. The freed vessel with all of its crew, is now heading towards the UAE coast," the source added. "The pirates are under guard and will be handed over to officials of the UAE Ministry of Interior on arrival at Jebel Ali." "The decisive operation is evidence of the determination of the UAE Government to respond swiftly and deal firmly with any acts of piracy," the source said. He added that the operation also indicates the UAE's determination not to subject to such threats. Earlier, the Abu Dhabi National Tanker Company (Adnatco) and National Gas Shipping Company Ltd (NGSCO) said in a press release on Saturday that "We have been assured that all crew members are safe and in good health. The company management is monitoring the situation closely in coordination with relevant government authorities." As the shipping arm of the Adnoc Group of Companies, Adnatco and NGSCO own and operate a fleet of carriers for transporting LNG, petroleum products and sulfur as well as Ro-Ro and bulk cargo ships. They are also involved in the marine transportation of petroleum products, ship bunkering and the bulk transportation of sulphur and transport polyethylene produced by Adnoc's petrochemicals subsidiary Borouge from its plant in Ruwais to global markets.